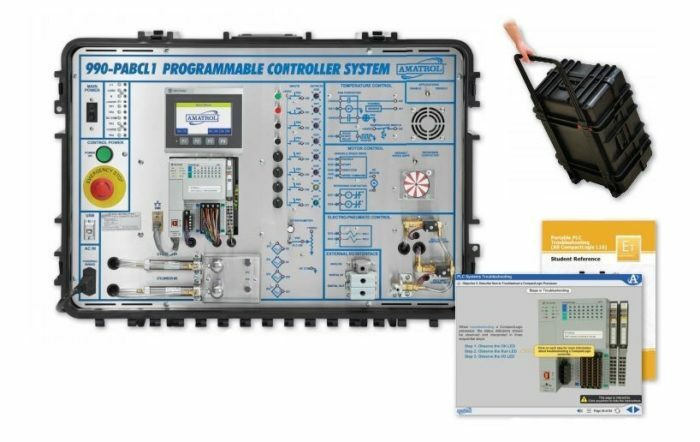 Amatrol’s PLC Troubleshooting Learning System for the AB CompactLogix (990-PABCL1F) provides comprehensive PLC operation and troubleshooting knowledge in a portable format for when training space is constrained, but skill-building cannot be sacrificed! Learners will study topics like PLC program operation, PLC programming, PLC motor control, time and counter instructions, pneumatic cylinder control and more! Combining training in areas such as thermal control, motor control and pneumatics, the Portable PLC Troubleshooting offers learners the chance to operate the powerful Allen-Bradley L16ER CompactLogix 5370 PLC, PanelView 800 HMI terminal, and networks throughout the curriculum to build PLC training skills. The PLC training system’s interactive multimedia curriculum offers an unmatched breadth and depth of knowledge and skill-building. Only Amatrol can provide this level of training using a compact, portable workstation. Portable PLC Troubleshooting includes an Allen-Bradley L16ER 5370 Processor & HMI Screen, two double-acting pneumatic cylinders, two control valves, a potentiometer, variable speed drive, external I/O interface, temperature control and an emergency stop button all within a portable learning system. Learners will use these components to perform troubleshooting skills on a variety of topics, such as thermostatic temperature control, variable speed motor control with feedback and electro-pneumatic controls. Learners will also practice the programming and operation of industrial PLCs. Portable PLC Troubleshooting’s extensive multimedia curriculum begins with PLC operation and programming, and then builds onto this knowledge by advancing to topics such as analog input / output troubleshooting. By combining theoretical knowledge and hands-on skills, the learner’s comprehension and retention of troubleshooting systems is greatly enhanced. The 990-PABCL1F can be used with the Industry 4.0 Fundamentals course to serve as a PLC training device and Table Top “Smart Factory” Cell Controller. Amatrol’s Smart Factory is a fully connected and flexible manufacturing system that connects its physical systems, operational information and human assets to control manufacturing, maintenance, inventory, and supply chain operations. Portable PLC Troubleshooting uses Fault-Pro, the industry’s premier program utilizing an electronic fault insertion system that is only available from Amatrol, to implant 30+ faults into the system for troubleshooting. During the learning process, Fault-Pro allows learners to insert faults in the system as they progress through the step-by-step procedures learning industrial troubleshooting methods. Then, Fault-Pro can be set to randomly select and insert a fault to test a learner’s troubleshooting abilities and prepare them to solve real-world technical problems once they’re in the field. A sample copy of the PLC Troubleshooting AB CompactLogix Student Reference Guide is included with the learning system. Sourced from the curriculum, the Student Reference Guide supplement this course by providing a condensed, inexpensive reference tool that learners will find invaluable once they finish their training, making it the perfect course takeaway.